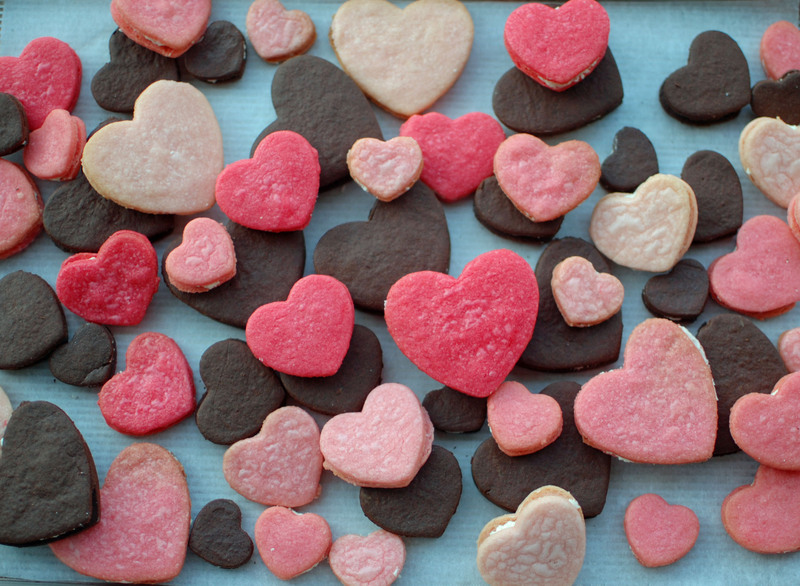 I know that Valentine’s Day has come and gone, but I just had to post these gorgeous cookies! In preparation for Valentine’s Day I spent a Saturday afternoon in the kitchen making these beautiful heart sandwich cookies which caught my eye sitting there on the front cover of Martha Stewart’s Living Magazine. I have made a couple of Martha’s recipes. One of them was a great success in my classroom two years ago at Christmas. Even though it took us four days to make them it was worth it. What I am leading up to is the fact that the cookie recipes of Martha’s seem to be so time-consuming! I know that she has lots of helpers in her kitchen, but there is just one of me. The active time given for completing this recipe was 3 hours and 25 minutes. I spent five hours. If you have ever spent five hours doing one recipe you know that when you are finished you don’t even want to eat what you have prepared or it just doesn’t live up to all that time spent in the kitchen. In other words, I could not be the judge of these cookies. I took them to school and let 60 of my students judge them. Teenagers love Valentine’s Day! It’s not just about boyfriends and girlfriends. They want to share the day with their friends and families and sometimes their teachers. School was really buzzing today with candy, flowers, cards, stuffed animals, cake, cookies, and balloons. There was some buzz around my room, too. Word got out that I was decorating Valentine Cakes for my classes and you would have thought I was giving away one hundred-dollar bills. It was only cake and not even one made from scratch! Now that I have made this cake three times in two days I think that next time it could be a piece of cake! This has been a frustrating experience for me to say the very least. I was using The Smith’s Family 12 layer cake recipe. The first attempt resulted in little rubber disks that resembled frisbees. I thought after the batter was ready to put in the pans that it was really runny, but why would it be the wrong proportions after all it is found at Oprah.com. I blamed the mess on my ineptness at measuring correctly and threw the frisbees in the trash before icing them. So I start all over again this time being careful to measure all the ingredients before mixing even one granule of sugar with a bit of butter.